Eric Zimmerman is an internationally recognized creative force, design scholar, and expert on game design and game culture. Eric was the co-founder and Chief Design Officer of Gamelab, a NYC-based game development studio which was in operation for nine years. Since Gamelab, Eric has worked on a wide range of independent projects. He also co-founded the Institute of Play, a thriving non-profit that has created schools based on games and play as the model for learning. In addition to creating dozens of games of all kinds, Eric has taught at MIT, School of Visual Arts and Parsons School of Design. 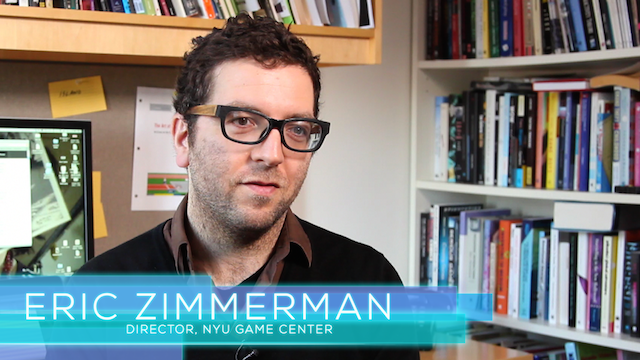 He is a founding faculty member at the NYU Game Center and a full-time Arts Professor at Tisch School of the Arts. Eric is the author, with Katie Salen, of Rules of Play: Game Design Fundamentals, the standard textbook for game design, and of The Game Design Reader, an anthology of readings about the design and culture of games. He has received numerous awards for his work in the game creation community, including a “VIP Award” from the International Game Developers Association. Other recognitions include: New York Observer’s “Power Punks”, Interview Magazine’s “30 To Watch”, International Design Magazine’s “ID 40” list of influential designers, and The Hollywood Reporter’s “Digital 50”. Recent projects include Leela, a game for the Xbox Kinect developed with Curious Pictures and Deepak Chopra, and the award-winning short film PLAY, a collaboration with filmmaker David Kaplan. Eric lectures and publishes extensively on games, including frequent keynotes at major industry events.